hangar 404 to be precise, near Newquay. During holidays in the region I decided to check it out. As I was arriving around 16:00, aircraft were being put in the hangar again. This One Eleven arrived with the museum in April 2013, after having been made available by Qinetiq. When it touched down on April 26th, this was the end of an era. G-BGKE was the last 'One Eleven' to fly in the UK, and it is quite possible that this was her last flight. The aircraft is potentially flyable; maintenance is focussing on stabilising her condition, while the museum worka to raise the funds necessary to return her to the skies. 'Kilo Echo' was delivered to British Airways in 1980. After a career of eleven years it was sold to Marconi Avionics, for use as an electronics test-bed. She was repainted in the livery of the Defence Research Agency and moved to Farnborough in February 1994, adopting the military registration ZH763. ZH763 took some careful maneuvering. English Electric Canberra T.4 G-CDSX / WJ874 / ‘VN799’ Classic Flight’s second Canberra is a dual control T.4 variant and was the last T.4 to fly with the Royal Air Force. Built in 1955 at English Electric’s factory at Preston, Lancashire the aircraft was allocated the RAF serial WJ874 on October 27, 1950. Hunting Percival Jet Provost T.3A G-BWDS / XM424. Classic Flight’s silver Jet Provost was built as a T.3 at Hunting Percival’s Luton factory in 1960 and issued to the Royal Air Force as XM424. Another view of Canberra T.4 G-‘VN799', while in the background looms a recent (august 2013) addition: one of the last 3 flying Vickers VC10 jetliners, ZA148. The first Vickers VC10 made its maiden flight on June 29, 1962 and the type would serve with BOAC and a number of overseas airlines throughout the 1960s and 70s. The example acquired by the Classic Air Force was built in 1967 and began life with East African Airlines as 5Y-ADA. It was then acquired by the RAF and converted into a troop transport aircraft, latterly being converted as an aerial refueller. Classic Air Force's deHavilland Vampire XJ771 (G-HELV) is a T55 variant, the export version of the T11 trainer used by the Royal Air Force. During its service with the Swiss Air Force, registered U-1215, it served at a number of bases, including Emmen, Altenrhein, Sion and Dubendorf. It remained in service until May 1990 (from 1958! ), completing 1.955 flying hours. The Percival Prentice first flew on 31Mar1946 but was found to have inadequate yaw control, so later aircraft had a large rudder and cut-outs in the elevators to allow it to move further. Classic Air Force’s Chipmunk G-APLO was built at the de Havilland factory at Hawarden, Chester in 1950 and given the RAF serial WB696. In recent years the decision was made to repaint the aeroplane to represent a Chipmunk of the Battle of Britain Memorial Flight. It was painted black with white training bands and RAF roundels and fin flash. Sadly, permission to fly in the scheme was later refused as the Chipmunk 'is still a current RAF aircraft'. The roundels and the fin flash had to be removed and the aircraft now carries its civil registration in large white letters. G-JAYI was built at Rearsby in 1946, receiving its Certificate of Airworthiness on March 7. She was sold to Appareillage Technique et Industriel of Belgium and registered in that country as OO-ABF. In 1959 she moved to Germany where she was re-registered as D-EGYK. By 1972 she emigrated to Denmark for a rebuild at the hands of Jens Jorgen Anderson, who placed her on the Danish register as OY-ALU. She remained in Denmark until 1993, when she joined Air Atlantique and returned to the country of her birth, reg'd G-JAYI in February of that year. G-JAYI became the first of the museum's flyable collection to arrive in Newquay, when Trevor Bailey flew her from Coventry to her new home in January 2013. Outside are still the military installations of RAF St Mawgan clearly visible. deHavilland Venom WK436 (G-VENM). Bbuilt in 1955, it was constructed in Switzerland by Pilatus under licence from deHavilland as an FB50 with the construction number 824. It flew with the Swiss Air Force (serial J-1614) and was used in high level photo-reconnaissance duties. Hawker Hunter WV256 is destined to become the museum's gate-guardian here at Newquay. Vickers Varsity WJ945 was originally built at Hurn Airport (Bournemouth) in late 1952. The aircraft made its maiden flight on 23Feb1953 and was delivered to 527 Sqn at RAF Watton in Norfolk on 11Mar1953. Busy day at the office! My main interest in historic aviation are the vintage (propellor) transports, but since hardly any propliners, such as the DC-3, DC-6, Percival Pembroke or Twin Pioneer, were present I was quickly done here. Due to strong winds there had been no flying activities. The place lacked ambiance too, but we should allow the museum some time to set up shop properly. For aviation enthusiasts this new location is quite out of the way, but maybe the Classic Air Force can benefit from visiting families travelling the tourist trail, from nearby King Arthur's Tintagel further into Cornwall. As we did. Most of the above information was learned form this website and there is much more to be enjoyed there on history of the aeroplanes, activities by the museum and they have an interesting blog of various projects such as moving the museum and aircraft restoration. I have visited their previous location at Coventry a few times, check out my reports on UK 2003 and the AirBase Museum in 2011. 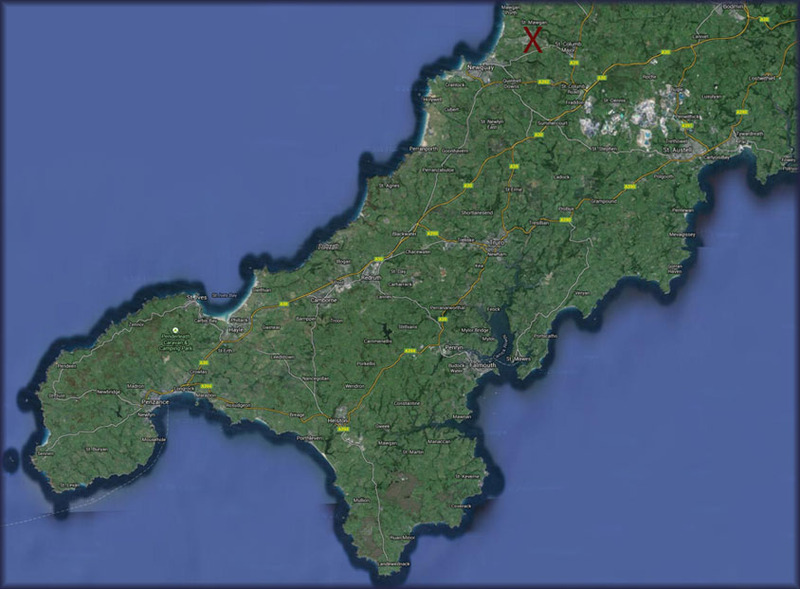 Royal Air Force Station (RAF) St Mawgan is a Royal Air Force station near St Mawgan and Newquay in Cornwall. In 2008 the runway part of the site was handed over to Newquay Airport. The remainder of the station still continues to operate under the command of the RAF. RAF St Mawgan used to have the widest military runway in the UK (300 ft) and is the home for the Cornwall Air Ambulance service. Airbase at Coventry closed its doors on the last weekend of October 2015. An era of propliners flying at Coventry had come to an end. The year 2015 brought the end to the Classic Airforce. The rent of the hangar at Newquay in Cornwall put a stop to that enterprise and the 2015 re-opening of the Airbase at Coventry lasted only a few months. It was not to be. Europe's largest collection of post-war classic aircraft is to be sold. 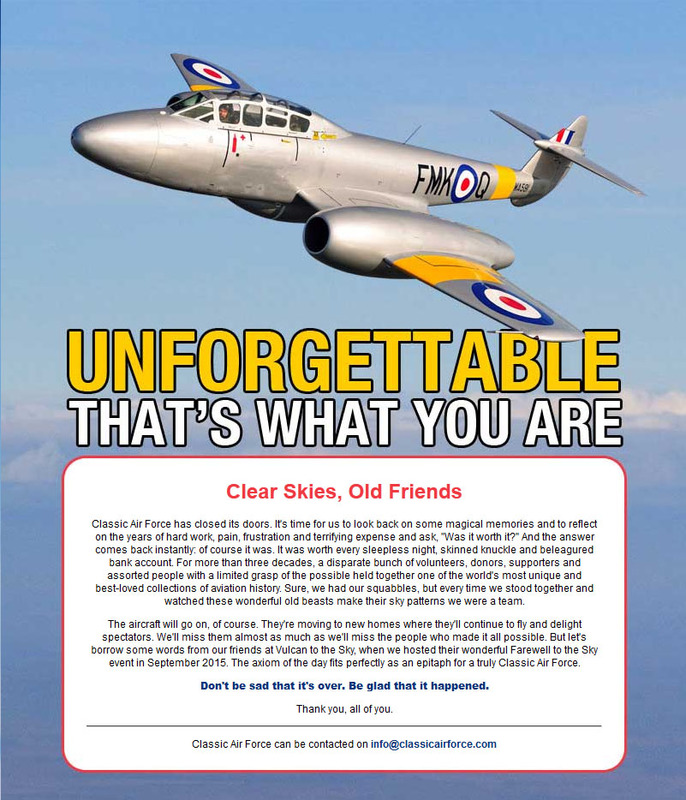 The Classic Air Force, which operates over thirty planes, including the world's oldest flyable jet, is actively inviting offers from interested organisations and individuals. The move follows the announcement by CAF's founder, Mike Collett, that he intends to retire. Now 72, Collett co-founded the Air Atlantique group in 1977, a freight and pollution control company that at one time owned the world's largest fleet of WW2 Dakota freighters. The Classic Air Force stable is unusual in that it focuses mainly on the Cold War years, an era ignored by most other historic collections. Most of its aircraft are either flyable or in the final stages of restoration to flight. They are a frequent and popular sight at air shows, and are regularly to be seen in the skies above the Flight's headquarters at Coventry Airport. Highlights include two Gloster Meteors – the T7, which is now the world's oldest flyable jet, and the NF-11 night-fighter, which is the world's only example still flying. The collection also boasts the actual Canberra that achieved a world altitude record of 70,310 feet (21,469 metres) in 1957." "The CAF operation at Newquay ceased earlier this year and the 'flyables' went back to Coventry. The majority (if not all) of the static aircraft were then taken over by some of the Cornish CAF volunteers who have set up their own organisation based at Newquay Airport called Cornish Heritage Aviation Centre. Aircraft were auctioned by Bonhams at Goodwood on 12th September 2015. The first five aircraft on offer at the auction were the Chipmunk, Proctor, Rapide (Delta Lima - the RAF schemed a/c), Vampire T.55 and the Anson. Not all aircraft reached their reserve price and thus a sale was not made. But the Dragon Rapide found bidding stopped at UKL 110.000,- sold to Cirrus Aviation of Clacton (reg'd 26Nov2015). The other aircraft were offered for sale through the Classic Air Force website and some have found a new owner by the time I write this update (May 2016). However DC-3's G-AMPY and G-ANAF remain at Coventry.